Summer is here! 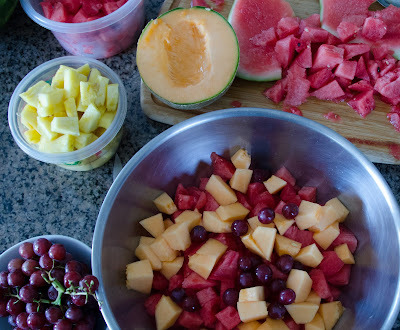 One of my favorite things about summer is fruit. 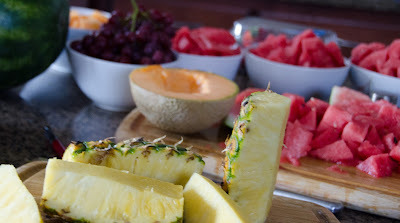 I absolutely love all kinds so I generally like to bring fruit to any party that requires me to prepare a dish because its something I love and it doesn't require heating or refrigeration. The only thing is, I always forget to bring home my dish. 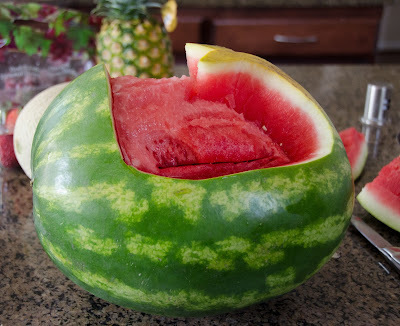 It normally happens every time so this time, I wanted to make a watermelon boat to hold all the fruit. This allowed me to leave it behind. 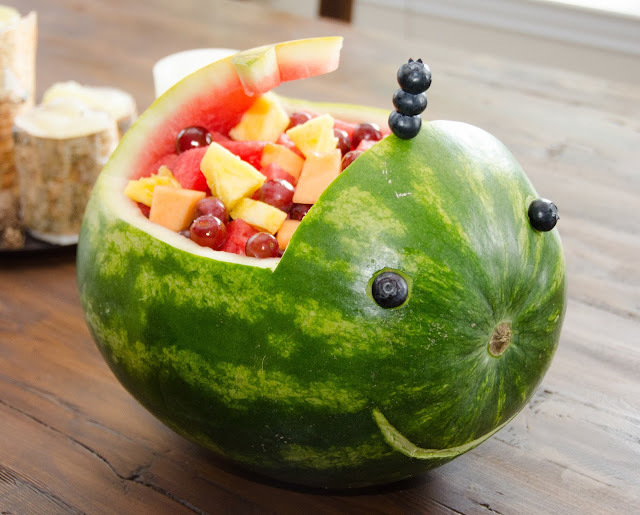 I decided to make a Watermelon Whale. Isn't he cute? 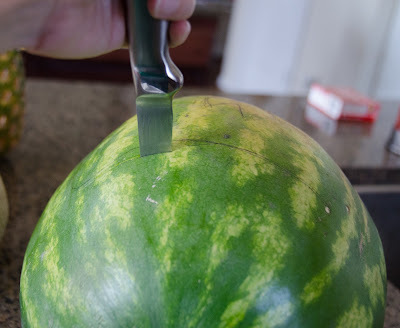 I'm not sure it was a good idea to make it right before the event because it did take a little bit of time to carve it out and cut everything up. 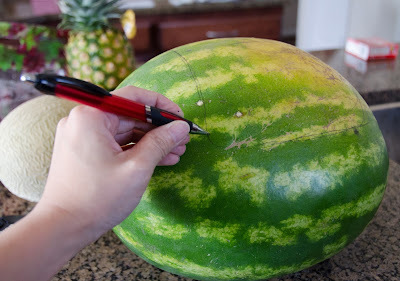 I first outlined where I was going to cut on the watermelon. I started to carve, using my outline as a guidance. 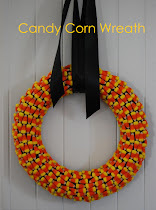 Once I was done, I popped off the top. It was surprisingly easy to do. 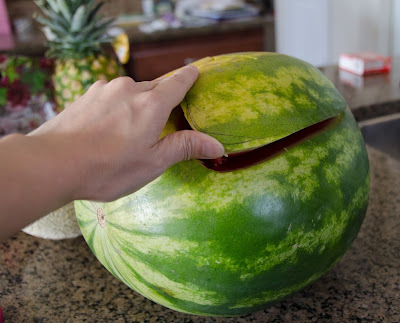 I touched up the corners and then I started to scoop out the watermelon to make it hollow. 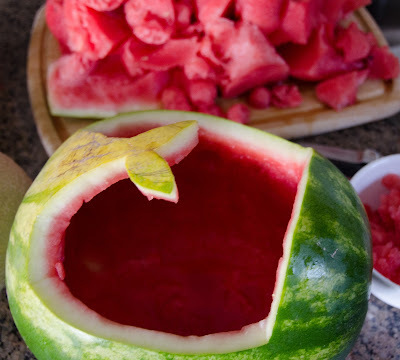 I carved out the eyes and mouth as well as cut up all the fruit. 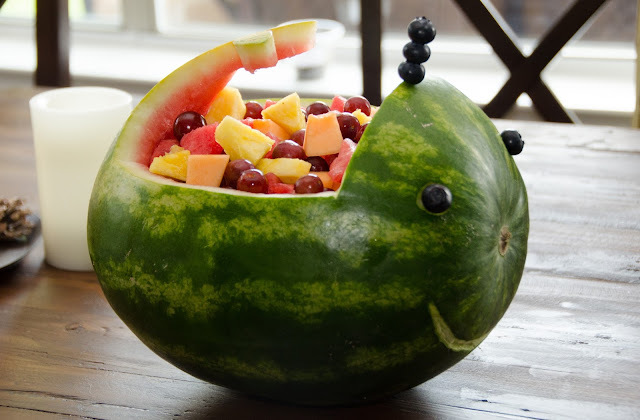 Once all the fruit was mixed up, I poured it into my whale and added the blueberries for eyes and spout. It makes me smile when I look at it.